With 6 world premieres, 9 national premieres, 2 original productions, 4 co-productions, 2 resident projects, 9 workshops and 2 site-specific projects, Short Theatre returns to Rome from 5 to 15 September 2018, one of the most important international events for contemporary performing arts and creations, now in its XIII Edition. In 10 days, in the spaces of La Pelanda, Teatro Argentina, Teatro India, the Biblioteche di Roma and several other urban spaces, the creations of 55 entities, including artists, groups and national and international companies with over 250 artists present for a total of 120 events and a decidedly large place left solely for education. A multi-disciplinary program which goes from theatre to dance, from performance to audio-video installations, from concerts to dj sets and makes room for “non-standard” projects, multimedia platforms, meetings, workshops and some important additions, such as Panorama Roma, the musical program Controra and the section Tempo Libero dedicated to workshops and training activities. It isn’t just a simple festival but a precious opportunity for encounters between artists, public, critics and technicians who, every year, create a true community and give life to a system of crucial relationships. 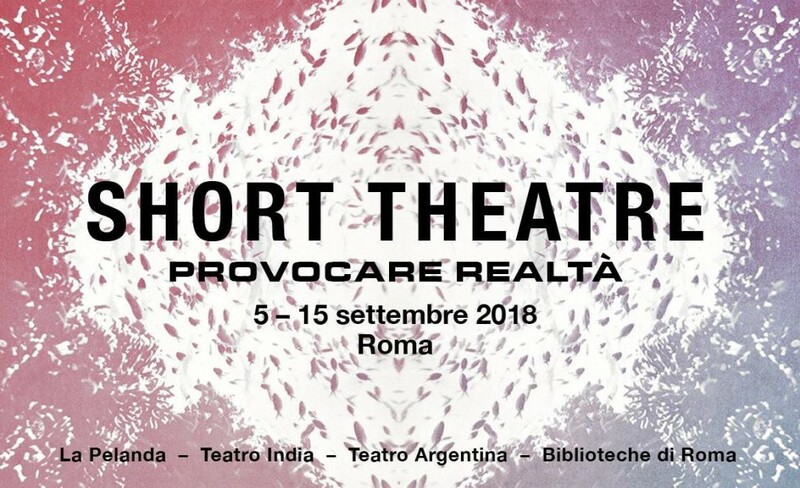 Short Theatre 2018 was conceived and organised by AREA06 under the artistic direction of Fabrizio Arcuri, the general direction and co-curation of Francesca Corona, and created with the support of the MiBAC and the Region of Lazio with the patronage and promotion of Roma Capitale - the Assessorato alla Crescita Culturale – the Sovrintendenza Capitolina ai Beni Culturali and the Azienda Speciale Palaexpo. It is held in collaboration with the Teatro di Roma – Teatro Nazionale and with the support of the Institut Français Italia, Istituto Svizzero Roma, Accademia di Spagna Roma, Istituto Cervantes Roma, Instituto Camões, Accademia di Romania, Istituto Confucio dell’Università Sapienza di Roma. Provocare Realtà or “Provoking Reality” is the title of this edition – more than a definitive and imposed theme, it is a key with which to invite the public to read between the lines of the program, seeking out its themes and the subtle shades of its meaning. “Provocare Realtà” expresses the renewed will of the festival to gather artistic itineraries that know how to question the real and how it is narrated, observing its mechanisms, scrutinising how it is represented, placing emphasis on the capacity of the contemporary in its languages to generate “new objectivity”. What stories are we not paying attention to? What are the forces to which we are not giving voice? Modifying reality through staging, rewriting the narration of the future, examining our relationships with urban spaces, reflecting on the body and on its political and social implications are the principal lines with which we can attempt to answer these questions. Among the main events of this Edition, the preview on 5 September at Teatro India with Tiago Rodrigues which is the world premiere of the final product of École des Maitres 2018 and, in the following 2 days, 6 and 7 September at the Pelanda in its National Premiere, Antonio e Cleopatra, the play which left its mark on the 2016 Edition of the Festival d’Avignone. Actor, director, producer and executive director of the Teatro Nacional D. Maria II of Lisbon, Rodrigues has staged a reflection on love and politics with Shakespearian echoes and homages to the Hollywood colossal of Joseph L. Mankiewicz with Liz Taylor and Richard Burton. Tiago Rodrigues will also hold a free masterclass open to the public on 7 September at the Pelanda. There will also be two showings of Gala by Jérôme Bel in its national premiere on 9 and 10 September at Teatro Argentina: after having involved the mentally challenged and the common public in his last two plays, the French choreographer is back to subvert the hierarchy with a dance-theatre piece that involves who is normally excluded from live performances, amateurs and those with non-conforming body types. Gala is presented in co-production with the Teatro di Roma – Teatro Nazionale—as part of Grandi Pianure – Gli Spazi Sconfinati della Danza Contemporanea, the festival which the city of Rome’s theatre has dedicated to contemporary choreography, curated by Michele Di Stefano – and as part of La Francia in Scena, the artistic program of the Institut Français Italia and the French Embassy in Italy. The collaboration of Short Theatre with France continues with another national premiere: on 15 September at La Pelanda the choreographer, dancer and researcher of Brazilian origins Ana Pi with Le Tour du Monde des Danses Urbaines en Dix Villes will accompany the public to 10 different cities throughout the world in a conference-play, for a public of adults and children, ages 8 and up, to look at the different styles of urban dance, showing the relationships between the movement of bodies and urban identities with political movements and social struggles. Reality explored through dance is also the perspective of Hope Hunt (and the Ascension of Lazarus) from the choreographer from Belfast Oona Doherty, on stage the 7th and 8th of September. Then, there’s Markus Öhrn – Swedish artist based in Berlin, with an unusual look at colonialism and the diversity of cultural perspectives with Bergman in Uganda, an installation with two points of view, dissecting the white middle-class narrated by Bergman in the film Persona from ’66 through the voice of the Veejay that accompanies the projection of the classics of cinema in the barrack-cities of Uganda, on 7 and 8 September at La Pelanda. A co-creation with Romaeuropa, The Quiet Volume is a performance that unites listening and literature, by Ant Hampton and Tim Etchells (founder of the company Forced Entertainment) which from 10 to 15 September, then to be staged again from 20 to 29 September at Romaeuropa Festival 2018, will be hosted in 3 libraries in Rome – at the centre of the performance, reserved to 2 spectators at a time, reading as an intimate and daily gesture. Engaging visual art, performance and literature, is also Belgian Sarah Vanhee, revelation of the latest editions of the Kunstenfestivaldesarts in Brussels. In Oblivion, with its national premiere on 14 and 15 September at La Pelanda, Vanhee stages a sort of “negative” of her private and professional life, through the sorting of trash that the artist herself has saved for a year. This attempt at rewriting reality focusing on contemporary tragedies can also be found in The Art of a Culture of Hope, a project of wide breadth from the duo of Jessica Huber and James Leadbitter (The Vacuum Cleaner), which intends to restore idealism in the future. In collaboration with Baobab Experience, the 2 artists will conduct a workshop with a group of people requesting asylum in an attempt to reform the narrative of a question that, today, is steeped in fear and resignation. The result will be presented on 11 September at La Pelanda in its national premiere. Fruit of an artistic residence and an original production of Short Theatre. the 2 projects presented in their world premiere on 13 and 14 September at La Pelanda by Bogdan Georgescu and Mihaela Michailov, 2 Romanian authors selected within the program Fabula Mundi – Playwriting Europe: the first looks at the influence that the Italian media had on the image of Romanian citizens while Michailov’s work concentrates on the testimonies of several Romanian women living in Rome. Then there’s the World Premiere of Combattimento, the new creation of Muta Imago which debuts on 13 and 14 September at La Pelanda: an exploration of the concepts of love and desire inspired by the music of Monteverdi and developed through the filter of courtship in the animal kingdom. Once again at La Pelanda and also a World Premiere, from 11 to 15 September, Leave The Kids Alone, installation/performance dedicated to the thorny topic of bullying by VicoQuartoMazzini, the winning company of the grant from PAV, Short Theatre and Theatres in the program Fabulamundi – Playwriting Europe. Continuing with world and national premieres, the installation Little Fun Palace from the company OHT, in residence at Short Theatre like Bad Peace, creators of a concert and a non-standard radio show inspired by the “bed in” of John Lennon and Yoko Ono; the performance In Between of What is No Longer and What is Not Yet by Spanish artist Juan Dominguez; and that of Claudio Stellato, 2, fruit of the project of European co-operation SOURCE which involves the Théâtre National of Brussels, the Festival of Avignon and the Trafo of Budapest; and the site-specific projects that deal with urban spaces (L’uomo che Cammina by DOM- a production of PAV as part of the Estate Romana program, and The End from the Milanese collective Strasse), and then the work of live expanded cinema Sanctuary by Carlos Casas, at La Pelanda in its National Premiere on 12 and 13 September. Spanish visual artist and film-maker, Casas conducts the spectator on a dreamlike journey of images and sounds—curated by one of the greatest sound designers and sound recorders in the world, Chris Watson—following the destiny of a group of elephants. Completing the incredibly dense calendar, creations involving dance, theatre and performance from some of the most important Italian artists, such as Annamaria Ajmone and Alberto Ricca Bienoise (To Be Banned from Rome), Babilonia Teatri (Calcinculo), Claudia Castellucci and Chiara Guidi (Il Regno Profondo. Perché Sei Qui? ), Claudia Catarzi (A Set of Timings), Filippo Michelangelo Ceredi (Between Me and P.), Fortebraccio Teatro (Sei. E Dunque Perché si fa Meraviglia di Noi? ), Jacopo Jenna (If, If, If, Then), Sotterraneo (Overload). It will be Ninos du Brasil along with Carlos Casas (live visual) to inaugurate, on 6 September, Controra, the musical program of Short Theatre 2018. There’s also Gegen, the historic evening from Berlin’s underground in collaboration with the Festival di Santarcangelo, the concert of the French-Israeli pop-wave duo Winter Family (as part of Francia in Scena), the live set of Taiwanese artist Jing, the first anticipated appearance of the project Soniche – le Signore dell’Elettronica which will really only take off next Spring, the dj set of London producer Debonair in collaboration with Spring Attitude, the evening—with music and literature—dedicated to Arab futurism created in collaboration with Nero and the dj sets of Lady Maru, St. Robot, Ubi Broki from the collective Strasse and Martina Ruggeri and Erika Z. Galli from the company Industria Indipendente. Among the new additions of this edition, the work sessions of Panorama Roma. In hopes of consolidating the dialogue among the protagonists of Rome’s art scene, artists and authors such as Alessandra Di Lernia, Federica Santoro, Giorgina Pi, Industria Indipendente, Artisti Innocenti, Timpano/Frosini, Salvo Lombardo, Dynamis will engage each other on 9 September about their respective studies, starting from the working materials of their latest creations. Finally, the workshops of Giorgia Ohanesian Nardin, Hugo Sanchez, Teatro e Critica, Da.Re, Modulo Arti – Master in Studi di Genere dell’Università di Roma3 and Dominio Pubblico Summer Moving 2018, will underscore the importance of education within the complex environs of contemporary artistic mediums.